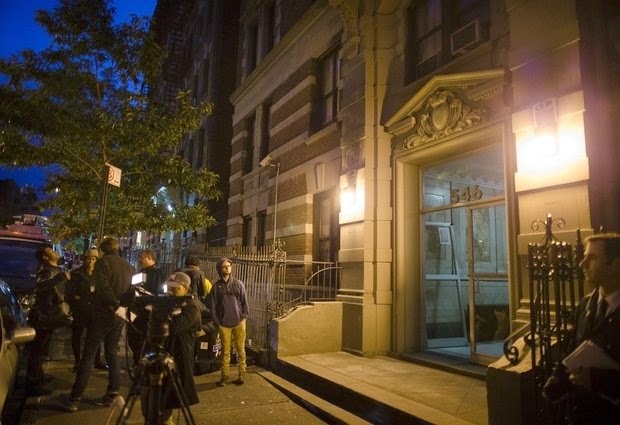 Media gather outside the home of Craig Spencer, a Doctors Without Borders physician who recently returned to the city after treating Ebola patients in West Africa, Thursday, Oct. 23, 2014, in New York. NEW YORK (AP) — A doctor who became New York City's first Ebola patient was praised for getting treatment immediately upon showing symptoms, and health officials stressed that the nation's most populous city need not fear his wide-ranging travel in the days before his illness began. Mayor Bill de Blasio and Gov. Andrew Cuomo urged residents not to be alarmed by the doctor's diagnosis Thursday, even as they described him riding the subway, taking a cab and bowling since returning to New York from Guinea a week ago. De Blasio said all city officials followed "clear and strong" protocols in their handling and treatment of him. "We want to state at the outset that New Yorkers have no reason to be alarmed," de Blasio said. "New Yorkers who have not been exposed are not at all at risk." The doctor, Craig Spencer, a member of Doctors Without Borders, reported Thursday morning coming down with a 103-degree fever and diarrhea. He was being treated in an isolation ward at Manhattan's Bellevue Hospital, a designated Ebola center. The Centers for Disease Control and Prevention, which will do a further test to confirm the initial results, has dispatched an Ebola response team to New York. President Barack Obama spoke to Cuomo and de Blasio Thursday night and offered the federal government's support. He asked them to stay in close touch with Ron Klain, his "Ebola czar," and public health officials in Washington. Health officials have been tracing Spencer's contacts to identify anyone who may be at risk. The city's health commissioner, Mary Bassett, said Spencer's fiancee and two friends had been quarantined but showed no symptoms. Health officials say the chances of the average New Yorker contracting Ebola, which is spread through direct contact with the bodily fluids of an infected person, are slim. Someone can't be infected just by being near someone who is sick with Ebola. Someone isn't contagious unless he is sick. Bassett said the probability was "close to nil" that Spencer's subway rides would pose a risk. Still, the bowling alley was closed as a precaution, and Spencer's Harlem apartment was cordoned off. The Department of Health was on site across the street from the apartment building Thursday night, giving out information to area residents. Still, the news rankled some New Yorkers. "Oh my gosh!" said Charles Kerr, 60, as his friends gathered on a Harlem sidewalk murmured. "This changes the situation. The guy must be coughing, sitting against people. Now you've got to think." Kerr said he wasn't afraid, but he wants a stricter approach to anyone coming from the Ebola-affected countries. "Stay in their apartment," he said. "Especially now, when it's so rampant. Especially if they know they've been in contact." The epidemic in West Africa has killed about 4,800 people. In the United States, the first person diagnosed with the disease was a Liberian man, who fell ill days after arriving in Dallas and later died, becoming the only fatality. None of his relatives who had contact with him got sick. Two nurses who treated him were infected and are hospitalized. The family of one nurse said doctors no longer could detect Ebola in her as of Tuesday evening. According to a rough timeline provided by city officials, in the days before Spencer fell ill, he went on a 3-mile jog, went to the High Line park, rode the subway and, on Wednesday night, got a taxi to a Brooklyn bowling alley. He felt tired starting Tuesday, and felt worse on Thursday when he and his fiancee made a joint call to authorities to detail his symptoms and his travels. EMTs in full Ebola gear arrived and took him to Bellevue in an ambulance surrounded by police squad cars. Doctors Without Borders, an international humanitarian organization, said per the guidelines it provides its staff members on their return from Ebola assignments, "the individual engaged in regular health monitoring and reported this development immediately." Travelers from Guinea, Liberia and Sierra Leone must report in with health officials daily and take their temperature twice a day, as Spencer did. He also limited his direct contact with people, health officials said. Spencer, 33, works at NewYork-Presbyterian/Columbia University Medical Center. He had not seen any patients or been to the hospital since his return, the hospital said in a statement, calling him a "dedicated humanitarian" who "went to an area of medical crisis to help a desperately underserved population." Four American aid workers, including three doctors, were infected with Ebola while working in Africa and were transferred to the U.S. for treatment in recent months. All recovered. Health care workers are vulnerable because of close contact with patients when they are their sickest and most contagious. In West Africa this year, more than 440 health workers have contracted Ebola and about half have died. But the Ebola virus is not very hardy. The CDC says bleach and other hospital disinfectants kill it. Dried virus on surfaces survives only for several hours. Spencer is from Michigan and attended Wayne State University School of Medicine and Columbia's University Mailman School of Public Health. According to his Facebook page, he left for West Africa via Brussels last month. A photo shows him in full protective gear. He returned to Brussels Oct. 16. "Off to Guinea with Doctors Without Borders," he wrote. "Please support organizations that are sending support or personnel to West Africa, and help combat one of the worst public health and humanitarian disasters in recent history." Associated Press writers Frank Eltman, Cara Anna, Cameron Young, Jake Pearson, Deepti Hajela and Tom Hays and researcher Susan James contributed to this report.